Warwick Bulldogs - Times Publishing Newspapers, Inc.
Warwick Baseball begins its 13th year as a youth sports organization using a Little League Charter that dates back 70 years! This organization is based in Warwick Township at Guinea Lane Park. They utilize seven baseball diamonds in one scenic park location with batting cages, playgrounds, walking trails and a snack stand with indoor bathrooms. One of the dedicated fields used for their T-ball program was recently re-designed as a whiffle ball stadium and donated by the organization to the community. Two of the fields are designed for the new Little League Intermediate Division for 13U players with 50/70 base dimensions and minimum 225-foot outfield fences. Boys and girls from ages 4 – 13 are encouraged to join their spring or fall baseball season. All-Stars from the spring in-house teams are selected to represent Warwick in the summer Little League tournaments. They have won 16 PA District 30 titles, 14 PA Section 6 titles, and three State Little League championships. The Bulldogs have been very fortunate to have their players compete against the best teams from across Pennsylvania like Taney, Collier, Redlands and Keystone for State Championships. They hope to put Central Bucks on the map during a trip to Williamsport one day! Consider joining their baseball family this year. They are a big family – a Bulldog Baseball family. Check out their website at www.warwickbulldogs.com and register for the Spring baseball season. 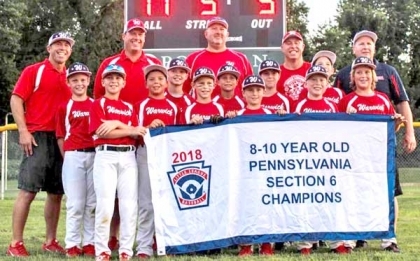 PHOTO CAP: The 10-year-old Warwick Bulldogs team won the PA Section 6 Championship in 2018.